What must you do at this junction? What must you do at this junction? Think you know the answer to this theory test question? This article explains vehicle handling and operation for cars and motorbikes in numerous scenarios. It is important information from the Highway Code which will help you pass your theory test. Driving through water is dangerous. If you don’t know the depth, don’t cross. When driving through a flood or ford, go slowly in a low gear and keep the engine running fast enough to keep water out of the exhaust – this could require you to slip the clutch in a manual vehicle. After a ford or flood you should test your brakes because they will be wet and this will reduce the friction between the pads and the discs. The same will apply with deep puddles. A ford is a crossing over a stream that’s shallow enough to drive through. After you’ve gone through a ford or deep puddle the water will affect your brakes. To dry them out apply a light brake pressure while moving slowly. Don’t travel at normal speeds until you are sure your brakes are working properly again. In winter a ford can ice over, or can be flooded and deeper than you expect. A rumble device is designed to warn you of a hazard ahead and to encourage you to reduce your speed. You can also find them before some roundabouts, villages and other hazards. At a blind junction it’s likely that you will see a STOP sign. You must stop behind the line then gradually edge forward until you can clearly see whether it is safe to proceed. 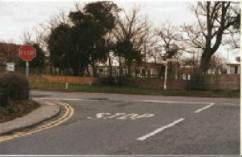 Traffic calming measures are a number of systems and road layouts used to slow drivers down. They can consist of speed bumps/sleeping policemen, chicanes, lane chokers, variable lane surfaces, and other obstacles. The aim is to make that stretch of road less dangerous for all road users, including pedestrians and cyclists. If a driver is ahead of you driving over speed humps slower than you would like to go, slow down and stay behind. Traffic calming measures are there for a reason: to slow traffic down to make it safer for pedestrians and cyclists. If you see a vehicle coming towards you on a single-track road stop at a passing place until they have gone by. Take extra care on single-track roads as high hedges can restrict your view of the road ahead. You should be able to stop in half the distance of the road you can see ahead of you in case you meet a vehicle coming around a bend. Areas reserved for trams may have white line markings, a different coloured surface, and a different surface texture. This is known as the reserved area and should be kept clear. Tram rails are extremely slippery when it’s wet. They can affect your steering and braking. Try to cross them at right angles. Trams cannot steer to avoid you so be careful when driving around them. They can accelerate quite quickly, too. Before starting your engine you should check that your vehicle is in neutral. If you are in a car, either the handbrake or the brake should be on (or both). If you are on a motorbike you should push forward to check the rear wheel turns freely. Your speed, the quality and condition of your tyres, the road surface, your reaction times and the weather will affect your braking distance. If you brake too hard you can cause the wheels to lock up. All new cars have anti-lock brakes (ABS), but this is not the case for motorbikes. Older cars might not have ABS. If your wheels lock, release the brake until the wheels regain grip, then apply the brake again progressively. Anti-lock brakes are most effective when you depress the accelerator firmly and keep it depressed. They prevent the wheels from locking up and skidding, and give you steering control while you are braking. They don’t work as well as locking the wheels on gravel and ice, though. If you are driving an older vehicle which has a manual choke, leaving the choke out too long will make the engine run too fast and that will make it more difficult when trying to slow down. Don’t drive in the snow unless it’s essential as it increases your risk of having an accident. Drive slowly in as high a gear as possible to reduce the chance of wheelspin. Roads can be extremely slippery when it’s snowy, as you can see in this video. 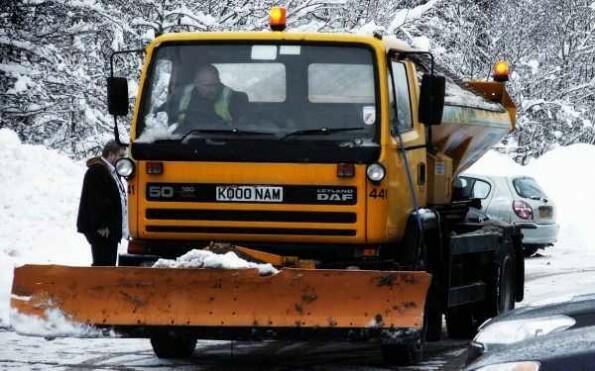 If you must drive make sure that snow and ice have been cleared from your windows, lights, mirrors and number plate. Chains can be fitted to your wheels to improve grip in the snow. They can help you to move off from rest or to keep moving in deep snow. You will still need to adjust your driving according to the road conditions at the time. It is not guaranteed that you will be able to move in any depth of snow even with chains, though. Without chains, hard packed snow fills the tyre tread and reduces the grip. If you don’t have chains, cloth sacks can help you get some grip. Carry a shovel in winter as a precaution. Rain and/or fog freezing on roads is called black ice. It can be hard to see. Indications of black ice are when you can’t hear tyre noise and the steering becomes very light. You need to keep your speed down and avoid harsh steering, braking and acceleration. Riding or driving in as high a gear as possible will help to reduce the risk of wheel-spin. If you are following another vehicle on icy roads remember that your stopping distance can be ten times that on dry roads. Four-wheel drive systems can help in slippery conditions as they improve traction. When driving in falling snow you should brake in plenty of time and use your dipped headlights. When following a snowplough you must not overtake it as there could be deep snow ahead. In hot weather the tarmac surface can degrade. Tar can melt bringing it to the surface and even forming small pools which are slippery for motorcyclists. They will also splash tar onto your vehicle – you can purchase a commercial cleaning product to remove this. If it has been sunny for a while and then it rains, the road will be slippery. This is because a layer of oil, rubber, dust and grime builds up on the road. When it first rains the water mixes with this layer and it can be treacherous. Over time, vehicles and more rain disperse it and it washes away. Take care at junctions and roundabouts, and particularly on painted white lines and manhole covers as they will be very slippery (motorbikes will usually try to avoid these). Allow double the usual stopping distance. Wet roads can also create glare so take care that you are not being blinded to the point where you can’t see what’s coming up on the road. Your stopping distance is likely to be double in wet weather so increase your following distance. Typical stopping distances (which include thinking and braking time) in dry weather are around 96m at 70mph, so that could be almost 200m in the wet. The braking portion of stopping from 50mph is around 38m (so you have to add in the thinking portion, too, which takes it up to around 75m). On a dry road the shortest stopping distance from 60mph is around 73m and around 36m at 40mph. Large vehicles can use spray reducers to help suppress the spray and make it easier for drivers following the vehicle to see. The higher the speed and the more water there is on the road, the more spray that is thrown up. Check it before you leave if it’s going to be wet. Aquaplaning is where your tyre rides up on top of the water and it happens because the grooves on your tyre are not sufficient to channel the water away. It removes almost all your grip. There’s a greater risk of aquaplaning when driving or riding at speed, for example on a motorway. Try to avoid large puddles when the road is wet to reduce your risk of aquaplaning. Large puddles also create extra drag on your vehicle which worsens the fuel economy and makes the engine work harder. When your vehicle is aquaplaning the steering will feel very light. Lift off the accelerator but don’t brake until steering returns to normal. Reduce your speed if visibility is reduced because you won’t be able to see hazards as far ahead. If daytime visibility is poor but not seriously reduced you can drive with your dipped headlights on. Examples might be if it’s raining or misty. You shouldn’t use your fog lights unless it actually is foggy and visibility is seriously reduced because this will dazzle other drivers as the rear fog light is as bright as a brake light. They will also make your brake lights less visible. There will be a warning light on your dashboard that shows when your fog lights are on – you need to make sure you know what each of the warning lights in your car means. If you have to park your car on the side of the road in fog do everything you can to ensure it can be seen by other traffic. This includes leaving your sidelights on. Bear in mind that with some modern cars it is impossible to leave the car with lights on. It’s preferable that you park off the road or in a driveway to ensure that you don’t create unnecessary risks for other drivers. Make sure your windows are clean when driving. This is especially important in fog, at times when your window is likely to fog up (a dirty windscreen provides more dust particles for water to condense around), and when there is sun dazzle. Hills will cause you to slow down sooner and they put more strain on the engine. The engine will need more power to pull the vehicle up the hill. When approaching a steep hill you should select a lower gear to help maintain your speed. You should do this without hesitation, so that you don’t lose too much speed before engaging the lower gear. When driving downhill you can use a lower gear to reduce the strain on your brakes, thus helping to avoid brake fade. Brake fade is when your brakes start to lose their effectiveness because they are overheating. Holding the clutch pedal down or rolling in neutral for too long while driving will reduce the control you have over your vehicle. This is called coasting or freewheeling and it means that if you need acceleration immediately, for example to get yourself out of danger, that it won’t be there. Coasting downhill is even more dangerous because it puts all the braking strain on your brakes which can quickly overheat and fade. Use your gears to help you control your speed. As you come up to a junction or corner you can change down a gear to help you reduce speed rather than always relying on your brakes. Choose the appropriate gear for the corner before you get to the corner – you shouldn’t be changing gears in the corner. To correct a rear-wheel skid, steer towards it, e.g. if the back end of your vehicle slides to the right, steer to the right to correct it. If you over-correct, though, your car might flick back the other way. Don’t brake suddenly as most of the braking power is over the front wheels, unless you have ESP (electronic stability programme) in which case you can apply the brake as much as is needed. ESP will selectively brake each wheel to help get you out of a skid. If you get a sudden blowout or puncture, you’ll need to react quickly. Read our guide to blowouts and punctures on this page. You are allowed to overtake on the left when you are on a one-way street, when the vehicle in front is signalling to turn right and in slow-moving traffic queues where the left-hand queue is moving faster than the right-hand queue. Don’t keep changing lanes to try to beat the queue as this actually slows traffic down. Every time you change lanes, the drivers in that lane behind you have to brake to allow you in and this reduces the overall speed of traffic. Traffic would flow much more smoothly if drivers didn’t make unnecessary lane changes. If you are overtaking at night remember that you can see less, it’s more difficult to judge distances of approaching traffic, and you might not be able to tell where the road goes ahead. Use signs and road markings to help you. Don’t turn your full beam headlights on until you are past the vehicle you are overtaking otherwise you could dazzle them. You should avoid overtaking if you are going to turn left shortly, if you can’t see the road ahead, if the vehicle is indicating right and when you are approaching a junction because another vehicle could pull into the opposite lane and you’ll have a head-on collision. Give cyclists and motorcyclists a wide berth if you are overtaking them in strong winds. Cars are least likely to be affected by crosswinds. High-side vehicles can be affected by crosswinds. If you see this sign then there are likely to be strong crosswinds. Large vehicles also create turbulence which can be problematic for caravans, cyclists, motorcyclists, scooter riders, horse riders and pedestrians. Remember that it takes longer to overtake a longer vehicle therefore you’ll need to allow more room when you start overtaking. Depending on relevant speed, it will usually take you longer to pass a lorry than other vehicles. Some hazards to watch for include oncoming traffic, junctions ahead, bends or dips which could restrict your view, and signs or road markings that prohibit overtaking. Make sure you can see that it’s safe to complete the manoeuvre before you start to overtake. These are more dangerous because traffic in either direction can use the centre lane to overtake. Indicate your intentions early. Read our advanced guide to overtaking here. On motorways, stay left unless you are overtaking. Scan the road ahead – you will be travelling fast and things can happen quickly. At night and in low visibility situations such as heavy rain or when there is surface spray you must always have dipped headlights turn on unless you have broken down and are on the hard shoulder, in which case you should have your hazard warning lights and sidelights on. If traffic suddenly stops ahead of you, you can use your hazard warning lights to warn drivers behind you. If visibility is low in fog you will be able to see the left hand side of the motorway as it will have red cat’s eyes (reflective studs). Between the lanes are white cat’s eyes, the right-hand side has amber and there are green studs between carriageways and slip roads. Read more about motorway driving here. You can improve your motorbike riding skills by practising off the road with an approved training body. All new motorcyclists must complete a course of basic training (CBT) with an approved training body before going on the road. This training is given on a site which has been authorised by the Driver and Vehicle Standards Agency as being suitable for off-road training. Safe riding is about anticipating other road user’s action, and choosing the appropriate speed for the conditions. You should assume that if a driver can move into your lane, that they might because you are less visible on a bike. If anything does go wrong, you should be wearing protective clothing at all time to help minimise the risk of injury or death in an accident. The main cause of motorbike collisions is other drivers. For the best control of your bike you should be able to touch the ground with both feet when sitting on the seat, and your arms should be slightly bent when you are holding the handlebars. Adjust the mirrors so that you have a good view behind you. When riding your bike you should look ahead, not at your front wheel as this will affect your balance. Try to always brake when in an upright position as this is the most stable position. This means that the tyres only have to cope with braking stresses rather than both braking and cornering stresses. The front brake should be applied just before the rear if you don’t have linked brakes. A normal riding position will be roughly central in your lane. You need to position yourself so that a car in front of you can see you in the rear-view mirror. If you are following a heavy vehicle, drop further back and ride so that you can see the driver’s side mirror; if you can’t see the vehicle’s mirrors, the driver won’t be able to see you. Riding with the side stand down can cause you to crash as it will hit the road when you lean for a corner. Most bikes have a circuit that stops the engine when the side stand is down. You should also be careful of roads with a high crown or with adverse camber when you are turning right. 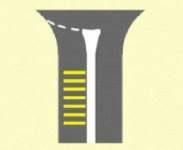 A high-crowned road is where the centre is much higher than the edges, and the same effectively applies on a right-hand turn for roads with an adverse camber. You are at more risk of catching your foot peg on the road when you lean for the bend. Motorcyclists should watch out for spilt fuel and patches of oil on the road as these will be very slippery. These are common where heavy vehicles park. Light diffracted by the fuel forms rainbow patterns on the road where there is spilt fuel. This is easier to see on a wet road, which is when it will be at its most slippery anyway. If you spot a patch of spilt fuel or oil, try to brake as much as possible before you get to it and steer out of its way if possible. Avoid braking heavily (or at all) on it, and be prepared to use your feet as outriggers to help keep you upright. Filtering through traffic is dangerous because you are less visible to other road users, you are riding on or near the white line (less grip, particularly in the wet) and vehicles emerging from junctions or changing lanes might not see you as you could be in their blind spots. Other road users may not expect or look for motorcycles filtering through slow-moving or stationary traffic. Your view will be reduced by the vehicles around you. Watch out for, pedestrians walking between the vehicles, vehicles suddenly changing direction and vehicles pulling out of side roads. To carry a pillion passenger on your motorbike you must have passed your full test and have your full motorbike licence. Your bike must have rear foot pegs and a seat for the passenger. When riding with a pillion passenger your bike will take longer to stop. It’s a good idea to adjust your headlight angle, put more air in your tyres and to firm up your suspension when carrying a pillion passenger. When riding in windy conditions keep your speed down so that if you are blown off course you are less likely to end up either off the road or in a lane with oncoming traffic. Be careful when you are in the lea of a building or a large vehicle and emerge from it as a strong cross wind can hit your bike. Use your lights, wear reflective clothing and never wear sunglasses or use a tinted visor. During the day you should use your dipped headlight to improve your visibility to other drivers, and wear bright-coloured clothing. The best place to park your motorbike is on firm, level ground. If you park on soft ground the stand can sink into the surface, causing the bike to fall over. Parking on a slope can cause your bike to roll or tip over, too. Use dedicated off-road parking areas if they are available. When you get back on your motorbike on a two-way road, get on from the left and apply your front brake immediately. The main causes of a motorbike skidding are cornering too fast, braking too heavily and accelerating too rapidly – these are all driver error as opposed to mechanical error. Getting out of a skid can be very difficult on a bike, particularly a front-wheel skid, therefore ride to the conditions and brake in good time for corners. If you need to stop quickly, apply the front brake before the rear and use progressive braking. If you do start to skid, release the footbrake first. If your bike is fitted with a traction control (TC) system this will prevent wheelspin under acceleration. 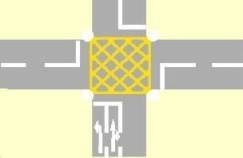 In wet weather, painted white and yellow lines, and manhole covers are extremely slippery. If you are filtering through stationary traffic you will be riding close to or on the white line so be careful when braking. Tar banding, wet mud, leaves, shaded corners in the winter, and loose chippings on the road will also have much less grip than tarmac. Slow down to stay safe and upright. © 2010-2019 DT Driver Training Ltd. Crown copyright material is reproduced under licence from the Driving Standards Agency, which does not accept any responsibility for the accuracy of the reproduction. The Driving Standards Agency does not endorse in any way any advertisement displayed on this website.